But really those diaper boxes are so perfectly sturdy they are far too good just to be sent into the recycling bin. So I finally did it. 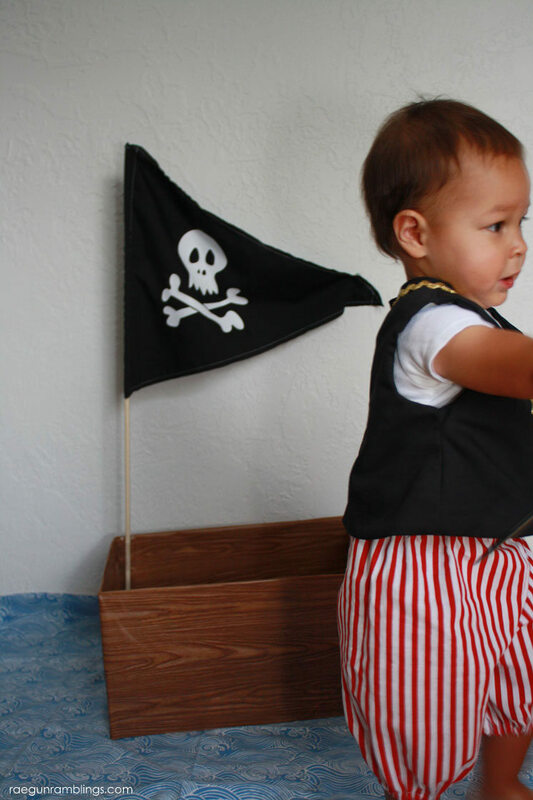 Okay you guys know I’ll take any excuse to dress Teddy up but come on doesn’t he make the CUTEST pirate? 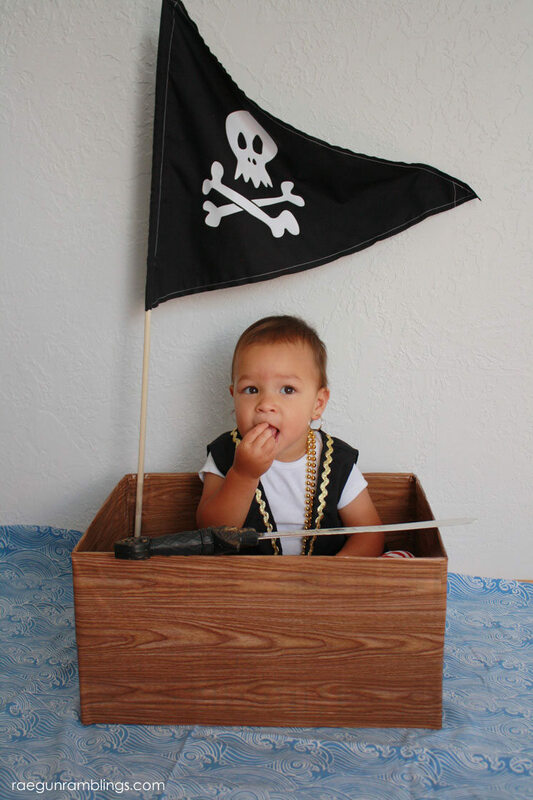 I used one of my pirate costumes from my Etsy shop. 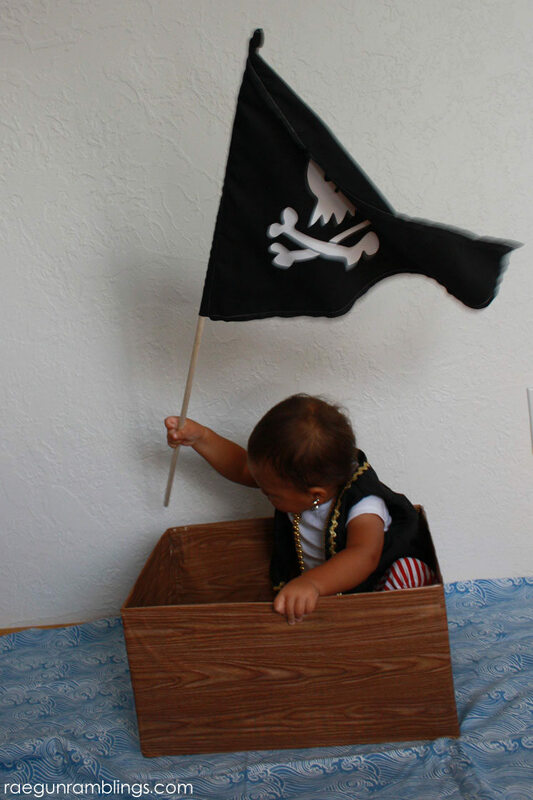 And we all know that a good pirate NEEDS a pirate ship. We always seem to have a box of our go to diaper, the Huggies Little Movers around for our non-stop little guy. We love that the new dry touch improvements make them work for day and night with their 12 hour leak lock protection. 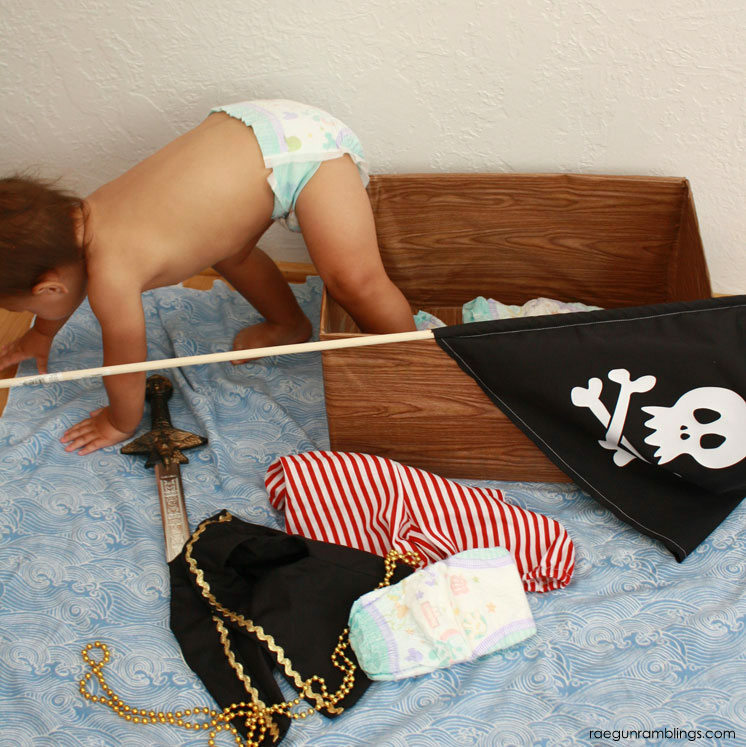 They just seem to be the driest diaper we’ve tried plus the boxes are perfect for upcycling. 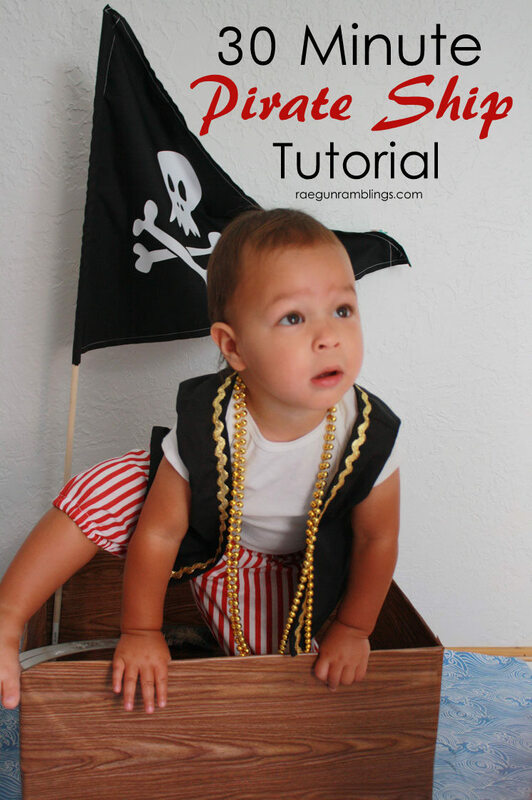 When you see how easy it is to make a cute little pirate ship you’ll be wanting to make your own one (or 10). 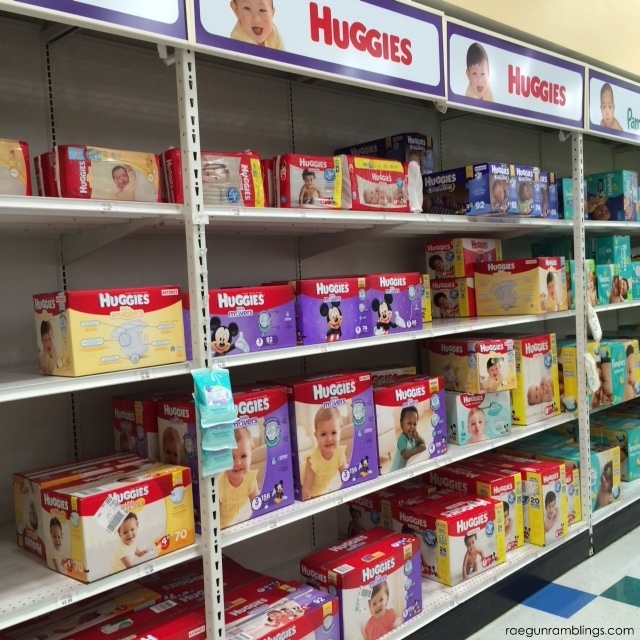 Depending on the size of your diapers the box sizes vary. But position your box so that you have it as wide and flat as possible. For me using the Huggies Little Movers Size 4 Box that I picked up at Babies”R”Us this had me laying it on it’s face (or back). So I cut off the back. I used the exacto knife to start it but then changed over to my junky scissors. Next tape any sides or flaps that need reinforcing. Cut a piece of contact paper the size of the inside of your box. Lay in your box. The contact paper is so nice since you can easily reposition it. Next cut your contact paper so that you can wrap it around the sides and inner sides of the box. For my Huggies box the contact paper fit perfect when folded in half lengthwise. All I had to do was wrap it around and then cut a slit on the inside when I fold it it down. But even if you have some gaps you can easily apply more contact paper. I liked folding the contact paper over the top edge since that made sure there wasn’t any potentially sharp or scratchy cut cardboard edge exposed. Now make your flag. I cut 1/2 yard of black fabric into 2 triangles but you can easily just use one layer of fabric or even paper. But my little guy needs durability haha. Next I sewed around all the sides leaving a 1 inch hole at the side bottom edge that will go on the dowel AKA the flag pole. Then I sewed straight up the perpendicular side to for a casing. This will be slid onto the dowel to display the flag. I used my Cricut cutting machine to cut a iron-on vinyl skull and cross bones. Then I ironed it onto my flag. You could also just use paper and tape it onto your flag. Read my iron-on vinyl tutorial if you’re new to using the stuff. Slide the flag onto the dowel. Now make the flag holder by folding a small piece of packaging tape onto itself. Take another piece of tape and place the folded piece in the middle and then tape that into one of the bottom corners of the box. Repeat for the top corner. Now you should be able to slide your flag pole in and out! So fun right!? You could keep going and decorate it with cannons or nautical ropes but we thought it was fun and durable as is. 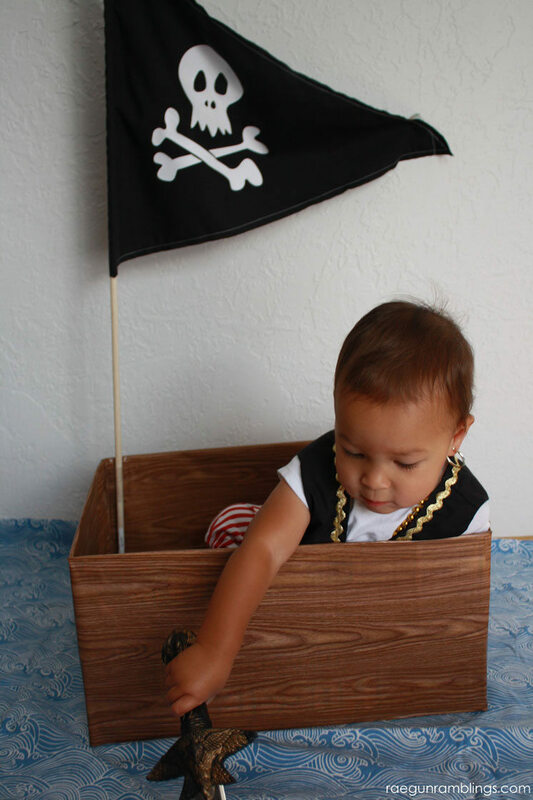 It would be really neat to make a bunch of these for a pirate themed birthday party. I could see all kinds of silly races or just an awesome photo booth! I think I’m hooked on upcycling diaper boxes, I’m thinking maybe cars or planes next. How would you transform the new Huggies Little Movers boxes? And do forget while you’re grabbing your diapers and everything else you need for baby at Babies”R”Us remember to use this coupon which will be extended! Learn more about the new and improved Huggies Little Movers diapers on their Twitter and Facebook Page! THanks so much we had a blast! What an adorable idea and it looks waaayy easy, my favorite kind of project! What a great idea!!! I love the wood contact paper. 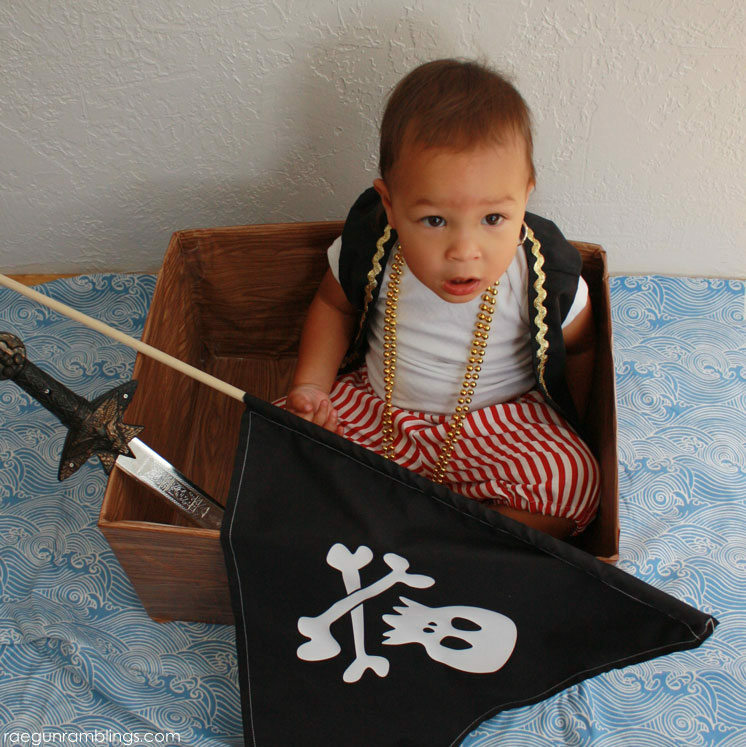 This is perfect with Talk LIke A Pirate Day next weekend! Thanks for sharing! What a great idea and awesome way to upcycle something that would normally just be tossed out! Thanks for linking up with us at the #HomeMattersParty!